It should be €300, right? Half of the €600 for a type 3 flight. Are you sure EC261 applies? Or that it doesn’t apply but that’s a method to work out the compo? If the other flight was full and took off. then surely Rob was bumped and due the €600. I actually agree, if there was no email or other attempt to contact then surely it is a case of IDB at the airport and 261 applies. Apologies Klaus Peter. I’m no EC261 expert but it appears you’re right, assuming Rob wasn’t delayed by more than 4 hours in which case full amount due. CWS’s FT page is invaluable. No compensation due as far as I can tell. For a start, I could have been moved prior to 14 days before departure – as I never got an email, I can’t tell. And I wasn’t 3 hours late, only 2 hours. Hello Genghis. What is CWS’s FT page? Surely My Flights would have notified you at some point if you were bumped 14 days ago? You would have received some sort of notification alerting you – unless it was when you went to check in? Virgin does not use Amadeus as its booking system, so it doesn’t work with MyFlight frustratingly. I agree with Genghis – this has to be worth a punt, Rob, for an IDB given that the original flight left without you. The onus is on Virgin to confirm when they notified you of the change to your flight and if they can’t demonstrate that they made reasonable attempts to contact you. You should still get €300 unless they can prove they informed you fourteen days before. My BA flight to Munich was cancelled a year ago and I had to get an earlier one, so I landed earlier than scheduled. I still get €125 compensation for IDB (50% of €250). Needless to say I didn’t get a restful nights sleep. Out of interest, was this flight a redemption or cold, hard cash? Rightly or wrongly, I always feel a little vulnerable having paid miles for a seat in premium cabin. I worry I could get bumped to the back in favour of a paying passenger, ruining either the start or end of my holiday. They are just flights. It is public transport. It is inconvenient if bumped or things don’t work out entirely according to plan, but to ‘worry’ about a redemption flight being bumped or have it ‘ruin’ the start or end of tour holiday is just plain silly!! It is not silly. Some of us work on extremely tight schedules when we travel, and we take an overnight flight to save time. If I get bumped there is no chance I’ll sleep, just cannot do this in economy. That means that on arrival I’ve lost a night and I’m arriving absolutely knackered, it will take me time to recover. It is time that I do NOT have if I have to hit the road straight after arriving. It’s not just inconvenient, it’s dangerous to drive on heavy sleep deprivation. Maybe you go on “lie on the beach” travel in which case possibly it isn’t such a big deal but don’t assume that all people travel like you do. To be fair to Jane she is explicitly talking about holidays not business travel or life and death situations. +1. You could have put it stronger Lili. And yes it is a life or death situation if on landing after a night like that you are going to get in a car and drive especially in unfamilar territory. BMI tried to do just that to me – luckily a number of weeks before the flight and I was immediately able to check that they were, indeed, still selling seats on the earlier flight they’d emailed me “Your flight is cancelled and you’re being moved to flight 3 hours later”. When I confronted them they moved me back. But in Rob’s case I agree with other poster IDB is the way to go. It’s clearly pants that they tried to alert you and in any case if they tried right before the flight how could they be sure you would receive. The travel policy in a company that I used to work for stated that if you flew overnight in business, you were expected to work the day you arrived. If it was overnight in economy, you were entitled to the next day off to recover – which was of course a waste of the travellers time as well as theirs! Jane, I’m glad you’re not my partner! Kept reading waiting for the compensation details to emerge. Don’t let us down Rob spill the goss. I’m also interested if Rob got compensation under EU261/2004, whilst it is involuntary denied boarding he did get back to the UK in the same class and within the 3 hour delay window, so I believe it’s as Klaus suggests, ie 50% of €600. We should adopt a zero tolerance for making claims with Airlines, if Virgin drag their heels, unless Rob’s contacts help move things along swiftly, I would recommend a letter before legal action as C-W-S recommends on Flyertalk BA compensation thread. As an aside, for anyone needing to progress a BA claim, I would not recommend using CEDR, whilst they are polite and try to be helpful, they are clearly swamped with claims and I suspect short staffed. 4 months on, still no EU261/2004 settlement from BA/CEDR for my downgrade. CAA report that it should take place within 7 days. I’m considering writing to them to investigate BA’s lack of compliance. I recently got a partial refund from Virgin Trains paid to me automatically within 72hrs of a delay and a polite email notifying me of such. I didnt even know I was entitled. Shows what can be done if there is the will to do so, but the amounts for airlines are so much larger I cannot see them instigating unless forced to do so. Why do lazy people need helping at the expense of those that can be bothered? When my company or my client pays for my ticket and I’m delayed, it’s not their child I don’t get to see before bedtime. When I’m delayed, it’s my personal time that’s used to absorb it. Why should my employer/client be compensated for that? Totally agree with how uncomfortable that seat is, Rob. On my recent flight back from Boston to Manchester I was expecting a refitted A330 and was surprised to find a 1-2-1 layout. Although eco and prem eco were half empty, upper class was rammed, so I wonder if they’d changed the plane to accommodate more folk (when selecting my seat it was a 1-1-1 layout). I found it an incredibly uncomfortable sleep, feeling really hemmed in at the top, with hardly any room to turn over. Quite disappointing and not helped by a quick eastbound flight time either. I’d definitely pick BA CW over this configuration. My recent Manchester – Boston flight was also shown as 1-1-1 but 1-2-1 on the return from New York. In fact, it was actually the same plane both ways with 1-2-1. My other gripe is being a compulsive cloud-gazer I don’t like the seat being angled away from the window and getting a stiff neck trying to look out whilst having to twist backwards! The article seems like fair comment to me. Given the bashing the BA seat gets I think it’s helpful to see how uncomfortable some of the alternatives can be. ….. because I never actually realised how bad the A330 was until last week, so I thought it was worth an article to inform others. I wouldn’t have written it if it had been an airline readers were unlikely to fly. The old Cathay Pacific herringbone config seems identical, I am surprised anyone is still flying these. I had exactly the same issues with length and width and luckily it was only a short day flight between HKG and SIN – I too avoided it going forward. More to the point, you were bumped without discussion; that’s a trick straight out of the BA playbook and I am disappointed to hear Virgin seem to be doing it too. Totally concur with Rob. I generally fly to Dubai for work with Virgin in PE but was bumped up recently to UC in the A330 they fly there and was very uncomfortable. Not as tall as Rob and still very cramped. That experience certainly deterred me from wanting to travel in UC on the A330 again way it is currently laid out so good article to bring to attention of wider audience. I had no idea this was an issue having never (yet) flown virgin and being a big fan of BA First (when it’s free). I love the way we are winging about the Upper Class on the Virgin A330 being awful (and it is being compared to the rest of the fleet) but a) we know it’s being replaced in the next 12 months and b) is still miles ahead of the BA equivalent! As a British airline, if this is as bad as virgin gets, then I think we’re lucky!!! I would much rather fly Virgin A330 any day over any BA business class …just a Shane they don’t fly to anywhere near the same amount of destinations!! I’m afraid I disagree. When I was sitting in the A330 seat highlighted above I was wishing I was in a CW seat instead, which isn’t as cramped around the shoulders! The 787 on the way out was comfortable though. I’d much rather fly BA club than VS A330. In fact the lack of privacy and also a seat which has to flip to be a bed mean I’d pick BA over any VS upper class flight. Very over rated airline imho. Disagree. I’ve flown every version of Upper apart from this one – and fortunately it’s on its way out. In my opinion VS comes out on top over BA every time in all aspects. Apart from routes. Agreed 100%. Virgin tops BA in every aspect of everything bar routes. Club World is better than this seat (in the right seat). Any idea what it is like getting your feet hit constantly throughout the night everytime a person or trolley goes down the aisle? 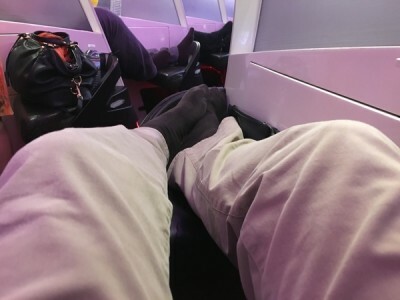 At least with CW I could have picked a better seat – all the A330 seats get your feet whacked. And the bar is f-all use on a 6 hour overnight flight. Give me CW over that virgin seat any day. For all its faults, CW at least offers a consistently decent bed. Well it wont be a debate to be had soon. The A330 seats in this current setup wont be around much longer so its a strange article really. For the record, we did a flight in Upper from Heathrow to Washington in May and it was 1-1-1 up until the day before we left. We got on the plane and it was 1-2-1. I refuse to let stuff like this ruin my enjoyment though. The plane and seat were tired but it was still a excellent flight and with brilliant service, as i always get with Virgin. I maintain its on a different level to BA all round. You had a day flight though. You wouldn’t have needed to sleep and, I would guess, never even bothered to convert the seat into the bed. That is a totally different situation to getting a seat on which it is exceptionally difficult to sleep for a red-eye service. I didn’t see a single passenger use the bar and very few, including me, bothered to eat either dinner or breakfast. Actually, I forgot to write about breakfast. The crew said that if we wanted breakfast we would be woken TWO HOURS before landing. This is on a flight which is scheduled at a touch over 6 hours. WTF?! I was hoping to write an article on the Virgin Revivals lounge at Heathrow but, as I had to be home by 10am to take my son to a birthday party, it wasn’t possible given that I landed 2 hours later than originally booked. I was grateful that I was ‘hand baggage only’ and could get straight out of Heathrow. The breakfast thing is absurd though. I had to read that twice, doesn’t make sense at all. Rob I get that you had a bad experience – fair enough but I haven’t had anywhere near such a rough time on any of my flights on Virgin. I’m 6’1 and have no issues with the seats – I’m also a fair bit wider than you with 42″ chest. I agree the seats aren’t the same as reverse herringbone but I don’t think they are bad. I’m not bothered about the window issue and like Johnny T’s wife I’ve slept well (not the world’s best sleeper here). The Revivals lounge isn’t massive but you can indeed get your breakfast there if you want. Obviously 2 hours before landing makes the sleeping time virtually pointless. Virgin are spending a few £million ripping out these seats which are under 5 years old, so I don’t think I’m in a minority here. 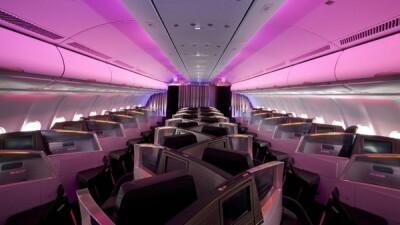 The new cabin will have 3 fewer seats than it does now so they are also giving up revenue by doing this. Interesting, the last time I flew Virgin quite a few years ago, I got bumped to Premium Economy at the gate simply because I was on a reward ticket and another carrier’s plane went sick so all the business passengers came to Virgin. It wasn’t handled well so I walked. Shame because I prefer the service to BA. Also is this further evidence of Delaficatin? 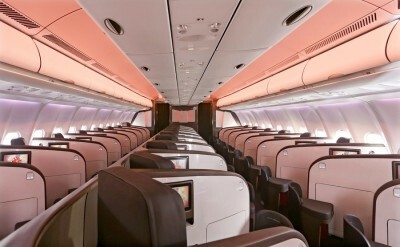 A minor gripe with the new format – which I readily admit is better – as found in the B787 and the retrofitted A330. The footwell of the seats are about an inch higher than the aisle, resulting in a prominent curved ramp. Despite knowing this, I have spent the last several flights falling over it – a terrible design feature. Also, is it just me or does the height of overall ‘booth’ surrounding the seats seem lower than that found pre-Dreamsuite? The sense of privacy has to a degree been lost. Same thing has happened to me. It informs me of a change on manage my booking. My original flight from New York lands at 0630 so I go into work but now I’m likanding around 0800. My original flight is still operating so they’ve shifted me for their convenience only. It’s a reward flight. That is exactly the same switch as I had …..
Ah, the great Virgin flight f**k up to the last year…. But you very likely did not get informed. Most people didn’t. Because this happened to, well, everyone flying VS in the last six months. Might not be everyone, but a stock take of v-flyer boards went along the lines “check your flights, the new IT system is crap” and loads of people coming back with changes. Could have been worse. I was never informed what they did with my flight. They changed the 13:00ish Boston flight to a 17:00ish one. So when they did this, they cancelled my flight, and STUCK ME ON A FLIGHT THE PREVIOUS DAY. I spotted this due to V-Flyer and phoned them up and got booked on a flight 3 hours later on the same day. However, I was never told. It turns out, because it turns out I had some cached data, that I could find out that I had already been moved on the Monday before the Friday flight. Whether I was moved weeks before that I don’t know, but it wasn’t a last minute change. Just out of interest, did you not have this flight on the my flights app and if you did, did that not inform you of the change? Do Virigin flights not appear on the My Flights app – just checked and my upcoming Virgin flights do not show.